Bathoorm remodeling can be tricky. 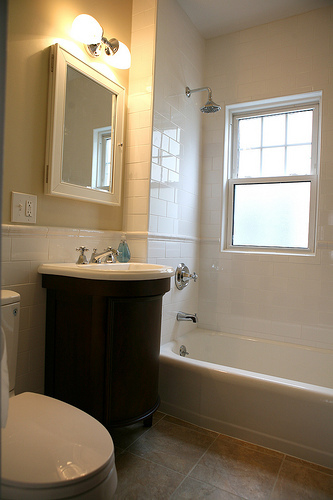 If you’re considering remodeling your small bathroom, it may be deceiving your very eyes. That’s not to say you don’t know exactly how much space you have to work with -- or do you? Think about the door. Most bathroom doors swing in. But in small bathrooms, the door can create awkward space jams with the fixture or vanity – not to mention an inside wall. A great solution that many homeowners don’t even consider? A pocket door that makes navigation a breeze. Put your plan on graph paper or purchase an inexpensive software program. Taking careful measurements and ascribing them to paper or a computer program will mitigate countless frustrations along the way. Imbue practicality into your remodeling plan. Bathroom remodeling is usually a great investment in terms of resale value, but not if you go over the top with the style and features of the rest of your home. Extend your practical mode of thinking to what you really need in a bathroom. For example, replacing a bathtub with a shower will take up only about half the space – room that you could use for other amenities. Minimize changes to the location of plumbing, which will save you money, unless a wholesale change makes sense for your long-term comfort. Choose light-colored flooring and large mirrors to make the bathroom look larger. Replacing a vanity with a pedestal sink will free up room, too. Consider recessed lighting to save space. Just like your kitchen, your bathroom sees a lot of traffic and so should be easy and fast to clean, so don’t overcompensate for the size of your bathroom with fussy amenities. Choose materials such as natural stone and stainless steel that are durable and low-maintenance. Bathrooms are obviously a room of necessity, but don’t forget about that element of surprise that can be hung on the wall, such as an antique shelf or a compelling picture. Few people expect to see a striking visual element in a bathroom, and they will quickly learn not to judge yours by its size. Get more remodeling and decor ideas with "DIY Home Improvements Ultimate Pinterest Guide" at the button below. And feel free to share. Pin it on Pinterest. Tweet it on Twitter. Post it on Facebook. Help us spread the word of cool remodeling ideas.